Today's Image of Mars shows a location near the mouth of Morava Valles, as imaged by HiRISE. Morava Valles is an outflow channel that scientists speculate was formed when Ladon Basin overflowed and sent water rushing toward the chaotic terrain to the north of Ares Valles. There are other valleys/riverbeds that seem to emerge from Ladon Basin. Something they all have in common are the layers exposed on the surface. As you can see in the image below these layers can be very distinct. Further study of these layered deposits will help scientists to verify that they were deposited by flowing water. Scientists may also be able to determine when the layers began getting deposited and when they stopped being formed. Determining this will allow us to get a better idea of when water was present on Mars, and how long it lasted on the surface. 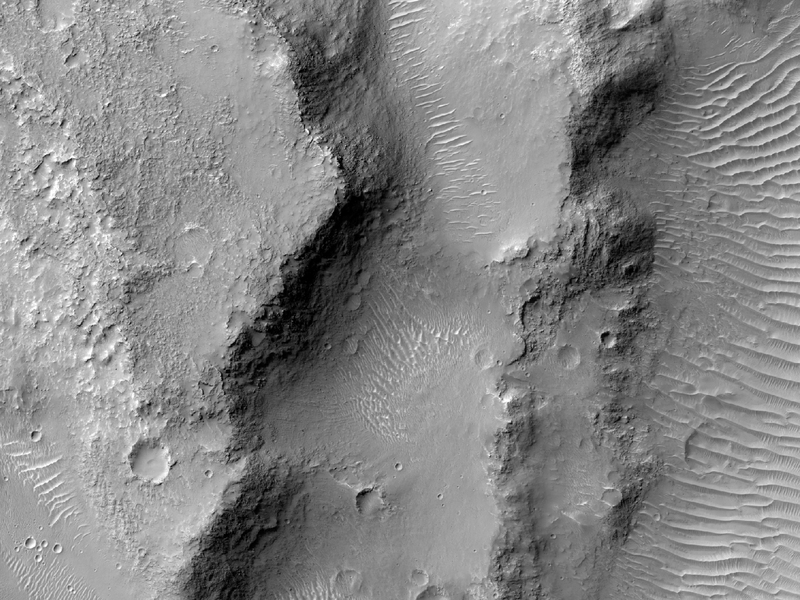 Click on this image to see the original high resolution image from HiRISE.